A rendering of the sports book at Circa, expected to open in 2020. Thursday, Jan. 17, 2019 | 2 a.m. There were plenty of surprises last week when downtown developer Derek Stevens rolled out his ambitious plans for the Circa Resort & Casino, but the images and details surrounding its multi-level, stadium-style sports book were not among them. The owner of Fremont Street casinos The D and the Golden Gate has been known to make some massive wagers of his own on pro and college sports and Tuesday plunked down $100,000 on a March Madness prop bet at the South Point. Sports and betting have always been a big part of his Vegas plans, and Stevens explained his inspiration for Circa’s impressive amenities during his unveiling event Jan. 10 at his Downtown Las Vegas Events Center. “When you think of a sports book and trying to create those wow moments, a moment people don’t forget, for me, I’ll never forget that moment I first walked into the Las Vegas Hilton SuperBook,” he said. “I looked around and thought to myself, my God, this is the greatest place on earth right here. So when you come to Circa and start just coming close to the sports book, you’ll see the VSIN [broadcasting] studio overlooking this three-story sports book, the largest sports book in Las Vegas history. The Vegas Stats & Information Network [VSIN] is the sports betting media company created by broadcasting legend Brent Musburger, and its presence is just one of the factors that could make Circa a very hot Vegas destination when it opens in December 2020. The accelerated expansion of sports betting across the country is starting to impact Las Vegas in different ways, but the Vegas sports book has been naturally evolving and transforming for a longer period of time. The Hilton is now Westgate Las Vegas and the SuperBook has remained an essential destination for bettors; it completed renovations in 2016 and now features 19 wagering windows, a nonsmoking space, more than 400 seats plus private booths, a mobile app and a 220-by-18-foot 4K video wall. The Las Vegas Strip has two new venues that take the sports book in different directions. 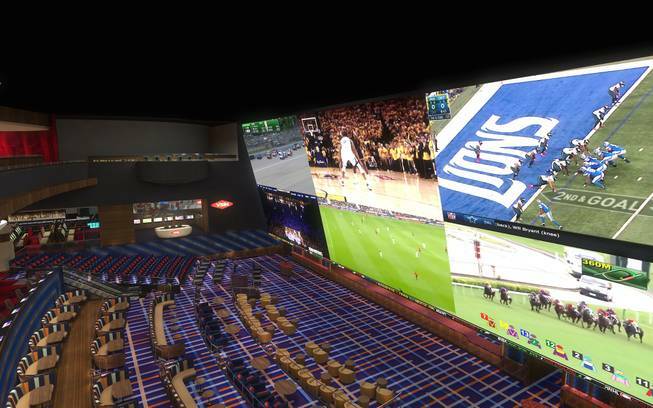 The Book at The Linq opened in the fall, an innovative reimagining of the classic sports book that incorporates “fan caves,” rentable living room-like environments with their own comfortable couches, 98-inch guest-controlled TV screens, Xboxes, VR headsets and food and drink service. There’s no paper at The Book; everything from the food menu to the beer list to the controls of your viewing and betting experience are handled via Samsung and Crestron tablets. The snacks come from the Sticky Chicken food truck located inside the casino and the beer can come from a self-serve wall of taps, if you prefer that to traditional service. At 11,000 square feet with 220 seats, The Book is a unique interactive and customizable venue. Park MGM debuted a new sports book ahead of the renovated resort’s grand opening festivities just before New Year’s Eve, but Moneyline Sports Bar & Book was eclipsed by the arrival of Lady Gaga, Eataly, and other dining and nightlife options Best Friend and On The Record. Moneyline appears to be a quick and convenient betting counter off the main casino, between the Juniper cocktail lounge and On The Record club, but walk through that space and you’ll discover a casual tavern with pool tables, a big bar and live entertainment Friday and Saturday nights. It feels more like your friendly neighborhood sports pub than a big Vegas book, but it just happens to be next door to T-Mobile Arena, the home of the Vegas Golden Knights.